This one involves an effort to keep the marshmallows from floating up too high. The batter has undergone major changes as well. Prepare ahead of time 32 ounces of yogurt cheese, derived from two 32-ounce containers (that's 64 ounces altogether) of nonfat yogurt. If the resulting yogurt cheese falls below 32 ounces, add back enough of the whey (that was strained out from the yogurt) to make up the difference. To this yogurt cheese combine 8 ounces of whipped, lowfat cottage cheese and 8 ounces of softened Neufchatel cheese ("light cream cheese"). Grease a 9 1/2" (or 9") springform pan, but do not wrap foil around it until just before the batter is added (spreading the crust in an already wrapped pan can result in greater disturbance to the foil, thus increasing leakage risks). Completely blend the above ingredients first, then continue with the next one below. Get this fully mixed in (moistened) with the other ingredients above. Afterwards, promptly add in and fully coat the last crust ingredient below. Place resulting crust mixture into bottom of the springform pan and pre-bake without tub at 300 degrees for 15 minutes, then cool enough to comfortably touch at least the pan's upper sidewall. Expect about 7 to 7 1/2 cups of the resulting batter, but do not add this to the pan all at once. Rather, this needs to be done in four installments. Wrap the pan in foil just before adding the first batter installment. For each of the first three installments, gently scoop about 1 cup of batter into the pan while trying to coat—as much as possible—the previous crust or batter layer below, especially the marshmallows that are still exposed on top (it's okay if some of them end up not being completely coated at first—the later a given installment, the more likely that these marshmallows are going to get fully immersed). After adding an installment, bake the pan with its contents for 25 minutes—at 325 degrees for the first two installments and at 300 degrees for the third—in a tub filled with at least 1/4 to 1/2 inch of boiling water. To reduce spillage risks, do not fill the tub all the way at this point, because the whole tub-and-pan assembly is going to need to be removed from the oven (in order to comfortably add contents to the pan) between installments. After all this is done, there should be close to half of the batter left, with 75 minutes of baking time reached at this point (25 minutes for each of the first three installments). Now comes the fourth (and last) installment—carefully add this remaining batter on top of the pan's other contents. Try to fully coat the entire surface, especially wherever marshmallows may still be showing. Next, return the entire pan-and-tub assembly to the oven, fill up the tub generously with boiling water, and resume baking at 300 degrees for another 95 minutes (based upon usage of a 9 1/2" pan). Afterward, shut the oven off, and leave its door slightly ajar, with the cheesecake still inside—and in the tub—for an hour. 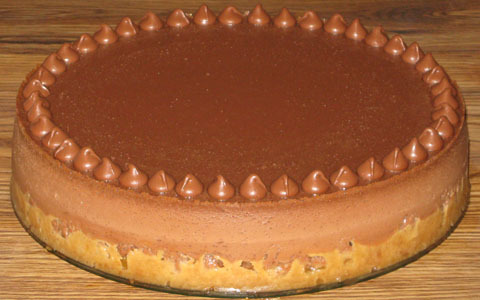 Next, remove the cheesecake from the oven and tub, and—if desired—add a border of milk chocolate chips (or use another variety—but milk chocolate is recommended for s'mores!) around the edge of this cheesecake. Continue to cool it down at room temperature for another two hours. After doing so, remove the cheesecake from pan and refrigerate. 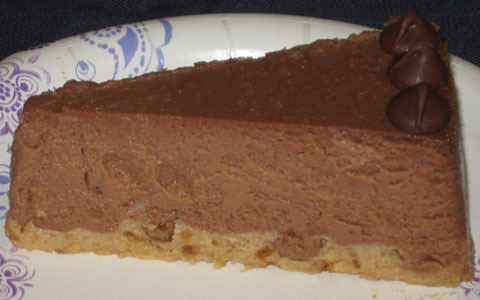 This one was the very first cheesecake that I ever brought to my dad's family synagogue. The event there followed a funeral for one of my cousins. The cheesecake fared well, with more than half of it consumed (with a number of my relatives commenting favorably on it). For this initial effort, I added the marshmallows before the ground-up grahams to the crust mixture then pre-baked all this for only about 10 minutes. A few weeks later, I made this prototype for a lunch (a farewell party for one of our associate pastors) following a Sunday service at Living Hope Church. The whole cheesecake (served among a reasonably generous selection of baked goods) was gone, probably within an hour. Only about 1/4 of it was left by the time I got to it (after having my main course first). And this time, per the "Graham Crust" instructions above, I added the marshmallows after the ground-up grahams to the crust mixture and increased its pre-bake time to 15 minutes—which I felt yielded better results.